Today, Hamlet Au wrote a column suggesting that the OpenSim user base is shrinking — and used Hypergrid Business numbers to support his position. The short answer to his question is: No, OpenSim usage is not falling, and the numbers do not support this. In fact, it is growing quite well. The reason being — the numbers Au is citing aren’t the full numbers, not even for the top 40 largest grids. In particular, InWorldz has only released its active user numbers once, last month, when it was at 4,500 active users. And New World Grid, one of the largest grids, stopped reporting active user numbers this fall. Assuming that both have been growing steadily, in line with the growth on other grids — and in line with their region growth — that would show a very different picture. Here are the raw numbers, without InWorldz (except this past December), and without active user numbers from several other grids, as well. 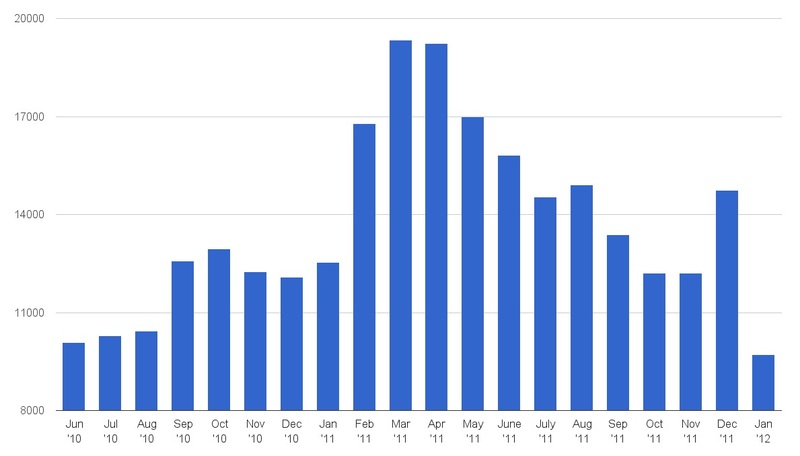 We did not collect active user numbers prior to June 2010. The spike in December is when InWorldz reported its active user totals for the first time — they did not report this data in January, and the total dropped again. 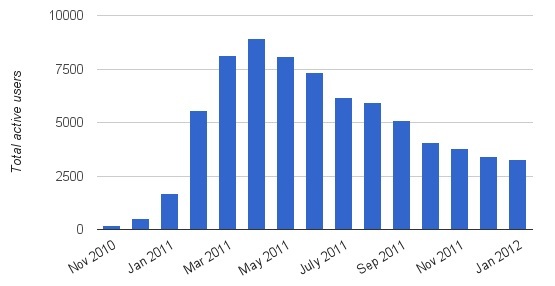 The big bulge in the spring of 2011, in the center of the graph, was due to a big marketing campaign by Avination. Many new users came to check out the grid as a result of the advertising, but only some stayed. But Avination’s performance is not an indication of OpenSim health overall, and neither is InWorldz reporting — or lack thereof. Once you account for these two factors, you can pretty much draw a straight line from the June numbers to the December numbers, and see a more-or-less steady growth, with seasonal increases in the spring and fall when school is in session. Again, the drop at the end isn’t a lack of users — it’s a lack of data from InWorldz, data which was included the previous month, and a lack of data from New World Grid. Au also compares the number of Hippo viewer users in 2009, with the number of OpenSim users on OSGrid this month. But Hippo wasn’t just used to access OSGrid, but many OpenSim grids, including all the uncounted standalones. And Hippo wasn’t just used to access OpenSim, since it can be used to access Second Life as well. And many people — including myself — now use the standard Second Life viewer for OpenSim because it supports mesh and media-on-a-prim. Finally, it’s not correct to use OSGrid as a proxy for all of OpenSim. OSGrid had around 2,500 active users at the start of 2009 — about a thousand less than it has now. But the other grids have grown substantially more in that time. 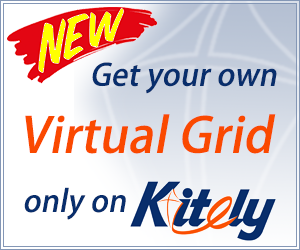 Part of the reason is that OSGrid is hypergrid-enabled, so people can enjoy OSGrid and all it offers, while basing their avatars on another, smaller grid — or even on their personal stand-alone. Another reason is that OSGrid tends not to focus overly on commercial activity. As a result, there’s no incentive for destination owners to try to beef up their traffic numbers with promotions or alternate accounts. 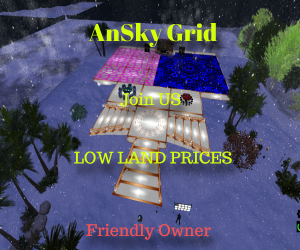 In other words, while the numbers of some heavily commercialized grids may be slightly inflated, the numbers for OSGrid are actually lower than they should be. But also, other grids are increasingly attractive to users. It’s not just experimental, run-your-own-region techies who are now coming to OpenSim. They dominated in 2009 and early 2010, and tended to favor OSGrid and other open, free-to-connect grids. Today’s OpenSim user base is much more diverse, and finding homes on regional grids based in Europe, on community grids like Gay Nations, on specialized role playing grids, and, of course, on commercial social grids of all sizes. But these numbers are only half the story. Actually, not even that much. We are tracking around 100 active grids right now, while the monthly reports only show the 40 with the most regions. Plus there is an uncountable number of university, business and personal grids. A couple of educational organizations — one in the U.S., one in Europe — tell me that they’ve got tens of thousands of users on their closed, secure school grids. Elementary schools, high schools and colleges are using OpenSim to teach classes in a broad variety of subjects. Non-profits are using OpenSim grids to provide substance counseling and other support services. Companies are using OpenSim for international collaboration, rapid prototyping, and marketing presentations. Now, for virtual world merchants and event organizers, that doesn’t matter. They want to know the number of users on OpenSim’s social grids — in other words, the size of their potential customer base. Which is fair, and the top-40 data would be most relevant for them. But judging OpenSim as a platform requires that all the other uses be considered — and there, OpenSim is clearly a growing phenomenon. Meanwhile, we’re looking at getting better data for all the grids. InWorldz has promised us that that they will begin reporting more details soon, and we’ve reached out to New World Grid to get updated numbers.